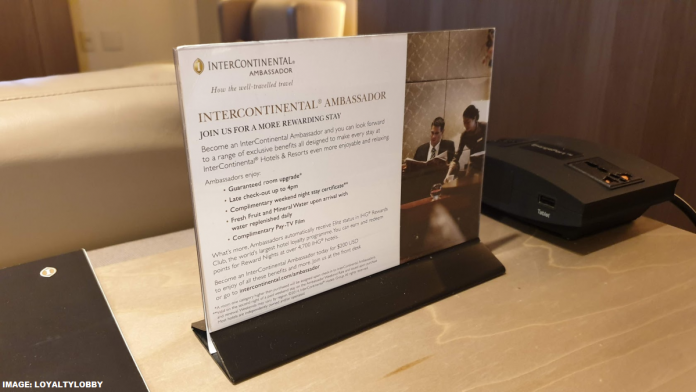 I was in touch with the IHG Ambassador Service regarding the refresh coming to the InterContinental Ambassador program and was told that March 1st 2019 is the date the changes will go live. I did inquire with them because I sought clarification from when on the breakfast benefit for Ambassadors in Greater China (including Hong Kong) applies as I’m going to visit there in about 10 days. Some of thee changes were leaked in December (see here and here). IHG then sent out an email to Ambassador members on Monday (read more here) clarifying some of the changes. John got a hold of an internal IHG document previously (see here) that explained the Ambassador and Royal Ambassador benefits for 2019. You can access IHG’s page for 2019 Ambassador benefits here. The IHG web page states that the Ambassador complimentary breakfast which will be newly implemented is only valid in “Greater China” and that includes Hong Kong & Taiwan per IHG’s interpretation. could you please clarify if the new T&C for Greater China IHG Hotels are in effect yet? I’m specifically talking about the “One complimentary breakfast every night you stay” as the website says it is valid from “Early 2019”. I’m planning to book a stay in Hong Kong and this value would make a big difference. Breakfast at both of the Intercontinental properties in HK does cost a pretty penny and to be honest unless you have it included in your rate or as a status benefit it wouldn’t make sense to pay for it (about 400 HKD). Warm greetings from the InterContinental Ambassador Service Center! This is Pat, and I’d be more than happy to help you with your Platinum Elite Ambassador account. -Discount or credit on restaurant and bars- including minibar. *Credit amount is specified per stay, inclusive of taxes and service charges, valid in select hotel restaurants, bars, and minibars. *Not applicable on in-room dining. *For any currency/region not mentioned, the equivalent of 20$ USD is to be given, converted at hotel exchange rate. -15% discount at select hotel restaurants and bars (excluding minibar). Limited to one member per room per stay and values are subject to change. -1 complimentary buffet breakfast in main restaurant per day, excluding in-room dining. Please be advised that the mentioned benefits will take place starting March 2019. Until then, the previous Ambassador benefits are still in effect. When John previously wrote about this there wasn’t a date available and in fact IHG hasn’t been forthcoming with this information. I saw in the comments that many of you had the same question as I did and hoped the Ambassador service would finally be able to provide a quid pro quo on the matter. Even though for me it’ll be too late which will likely make me stay at a Hyatt instead at least we now know when IHG will roll out their program adjustments. While this has gotten some criticism I sort of like the changes they made including the free breakfast for one person in greater China as this includes HK and also the US$20 credit vs the old “one drink” voucher. You can do a lot more with US$20 than to order a plain house wine or well drink. Premium beverages were often limited to Spire Ambassadors. I rather have $20 off and order whatever I want be it with a small premium or at an even lower price and I order two beverages especially if non alcoholic.